I admit I am not a crafty person at all. I have never even used iron on transfers before, I know! I wanted to make these awesome t-shirts for the kids while we were at Disney. You know just a little something for the boys but more for the birthday girl to acknowledge it was her birthday. I went back and forth with ordering them pre-made shirts but I could not find anything I loved. Finally I turned to Etsy and found these amazing designs. When I saw there were tons of Disney designs for the iron on transfers I figured how hard could this be? I looked, and looked and looked sort of like getting lost in Pinterest and stumbled on My Heart Has Ears. If you are looking for Disney related iron on transfers she is the one to go to! She carries EVERYTHING! So I finally found what I wanted and placed the order. The next day I ran over to my local craft store and picked up a few packages of Dark T-Shirt Iron on Transfers For Ink Jet Printers paper. I was told that dark is the way to go no matter what shirt you are using the iron on transfers on. I then tested a few sheets of paper to see which side was up and when you use the dark paper you DO NOT mirror the image. You will be ironing right onto the shirt as is. With the light paper you need to mirror the image and peel it off from there. I have heard the light paper does not come out as well as the dark too. Once I had my test sheets down it was time to print my actual Disney iron on transfers. Using the tissue paper provided you then iron on your transfer to the shirt or whatever you want it on. I had my wonderful neighbors help with this part. She is a pro at this and I did not want to mess anything up. She gave my daughters a pretty little design with a crafting tool, this way it was not just a plain rectangle. It is best not to use an ironing board, so she used her kitchen counter. Laid the tee shirt flat, peeled the backing and placed the iron on transfer. Using the tissue paper as a buffer between the iron on the transfer just iron on for a few seconds. I think they came out so cute! I made 2 for each of them for both days were were in the Magic Kingdom. My kids loved them and it made their Disney experience that much better. My daughter got such joy from everyone including guests wishing her a Happy Birthday! 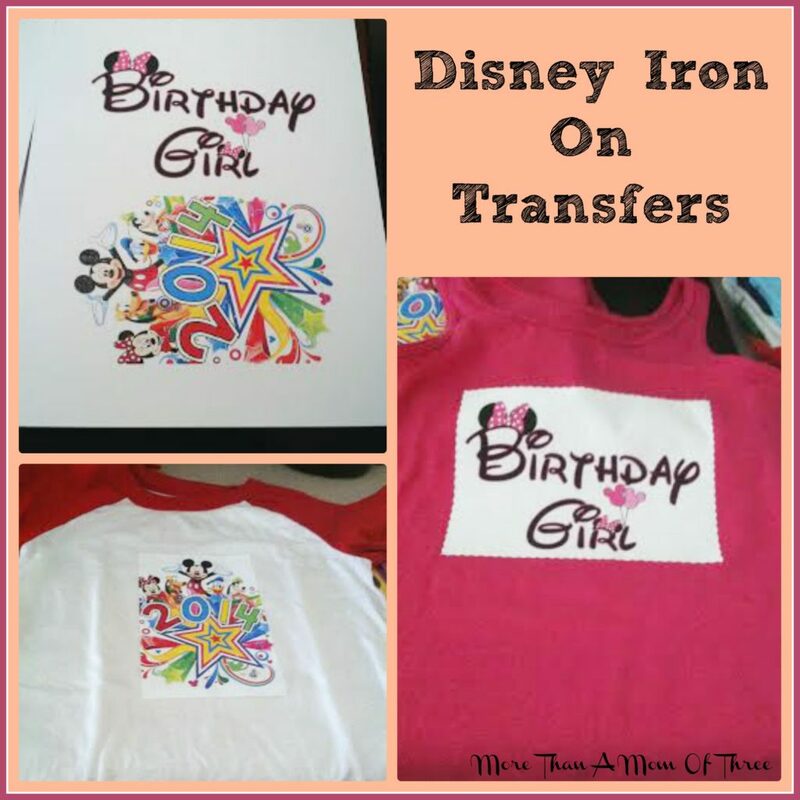 Do you use iron on transfers for anything? 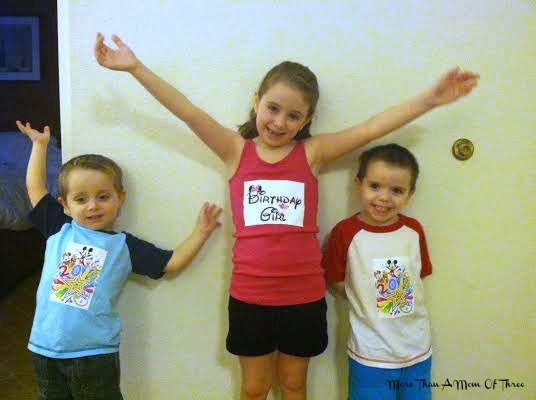 Too cute and a cool way to make your own Disney shirts for the the whole family. What a great way to celebrate your LO’s bday!! I have always been too afraid to even attempt this! I am a true klutz!! I have no children but there were a few I would not have minded having for myself over the years. So happy you were able to get your neighbor to do this for you and that your children loved their tees! So perfect. I can tell they are lovin them from those HUGE smiles. Go Disney! I love those iron on transfers.. holy cow, my Grandkids are going to be so happy when I do one for them. I remember “iron-on’s” they have come a long way. I’ve never been to Disney before, I wish I could go, but alas I’m living in a part of the world where this is just not possible. This is a very cute and practical arts. Your children look so happy wearing the T-SHirt. I am not a crafty person at all. I think I need to try this once later on. Thank you for sharing.